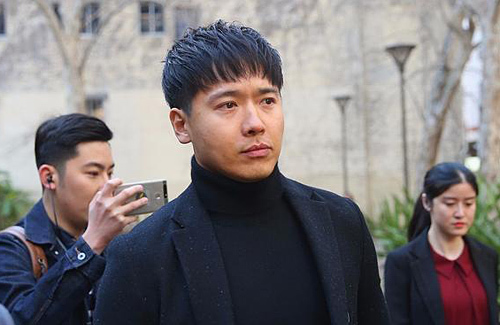 This March, Chinese actor Gavin Gao (高雲翔) was arrested alongside Wang Jing (王晶) for allegedly sexually assaulting a woman inside a hotel room in Sydney. After several attempts, Gavin’s defense team successfully got him out on bail until the next trial, which took place recently. Gavin’s wife, mainland actress Michelle Dong (董璇) and the couple’s one-year-old daughter were not present. The judge previously requested both the defendant and the plaintiff to provide all new evidence by August 23. The plaintiff’s team provided a new 36-minute video that was shot inside the hotel room where the assault occurred. It is alleged that the victim secretly turned on her camera and began secretly filming when she realized she could not fight off her attackers and escape. The video content is highly incriminating and may lead to Gavin’s guilty verdict. Gavin’s legal team, on the other hand, had no new evidence to produce. Instead, they claim that the surveillance footage and eyewitness account from the driver proved that the victim willingly went into the hotel room with Gavin and Wang Jing. Due to the amount of new evidence, the court postponed the trial to September 20, stating that they required more time to look into the material. If Gavin is found guilty, he would have to pay the victim and her legal fees, and faces up to a prison sentence of 20 years in Australia.